Single color, multi-color and all the way to full color printing are available. We offer one of the largest standard color selections in the industry. Additionally, customers can choose a custom color based on the Pantone Color System™. The color chosen often reflects the theme of the event. Sometimes, one color is not enough. Amazing Rings also offers swirled colors (with as many as 6 colors) and segmented colors (with as many as 7 color segments). Subtle or bold, the message style can really define a custom silicone ring. Debossed messages are sunken in to the band but retain the same coloring as the band. Ink Filled Debossed messages are sunken into the band and then have color added to the message by injecting silicone based ink. Embossed messages are raised, similar to braille in the same coloring as the Ring. Colorized Embossed, are also raised, and then a screen printed color layer is added to the top of the raised message. Screen Printed messages are imprinted onto the band with a silicone based silk screen or thermal transfer. Any message can be placed on the bracelet, depending upon the width. You can also add an inside message to the band, in either screen printed or embossed message style. It’s all up to you. The online design tool offers our standard colors and the option to choose any custom Pantone™ color you wish. We can even color match for you. Over 300 fonts are available to choose from or you may send us a custom font of your own. Thousands of clip arts are available to choose from. Additionally, you may upload or send to us your own custom art work or logo. If coloring is not enough for you, there is a solution for that. You can add glow in the dark to the bands, and choose between green glow and blue glow. We also offer UV color changing for white or clear bands (will turn purple), and the ever popular addition of glitter will really add some sparkle to your custom silicone rings. We offer a variety of sizes for our bracelets. Size is basically how it will fit on wearer. We offer small, medium, and large for all of the basic types of rings. Sizing options depend upon the types of rings chosen. That is not all we can offer you! If you have a special requests or wristband customizations, we offer a complete design notes and customer comments section with every order. Additionally, we offer unlimited revisions (within reason). We will tweak the design for you until you are happy. Nowadays in addition to all the advantages it offers it’s also growing as a boon for holding e-cigarettes in the form of vape bands. As you can see, custom-made silicone rings are just the marketing tool you need for your event. No matter the occasion or cause, the bands are bound to spread the message in the way you want. Their effectiveness is proven in their wide spread usage. 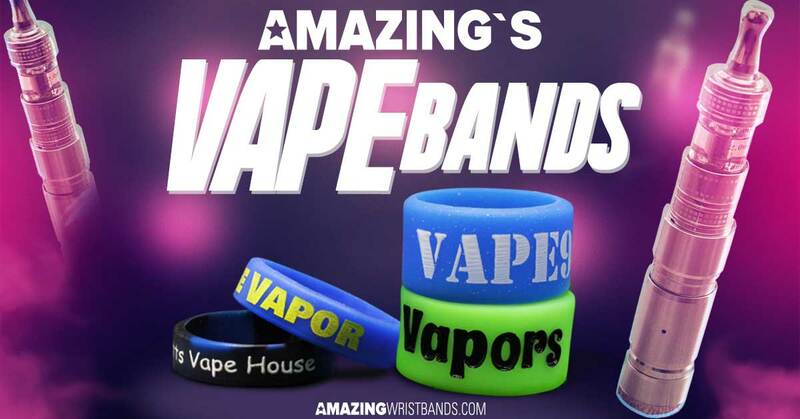 For your next event, order custom rings from Amazing Wristbands and you will be sure to make a lasting impression that you will be proud of with our 100% silicone made products.